My neighbor pulled down his house and is now building something new. The house cannot have been more than twenty years old - at the most. Yet this is the habit in Iraq: old is bad, new is nice. For that reason, hardly anything old is left. I come from a country where the old buildings are carefully preserved; tourists love the canals of Amsterdam for that reason, and the center of old towns like Zwolle, Edam, Volendam. Preservation is only possible if people see the sense of maintenance, of repairing what is broken. Yet the new riches in Iraqi Kurdistan want new things, and do not treasure the old. They need to show off that they can afford to buy and to build. And when they do, they often use cheap materials like concrete blocks and build houses that will look bad again in a couple of years. Of course, this is an old and well-known phenomenon and definitely not unique for Iraq. The town of Zwolle that I mentioned before, only kept its beautiful old heart because of the poverty that swept over this once very prosperous trading town. Holland also had a boost of renewal - and yet at the same time people were protesting against it. When in the seventies the metro was built in Amsterdam and a historical but rather derelict neighborhood was to be demolished, protests soared. This was mostly because of the cheap housing that was getting lost, I must admit, but also because an authentical part of town was torn down. 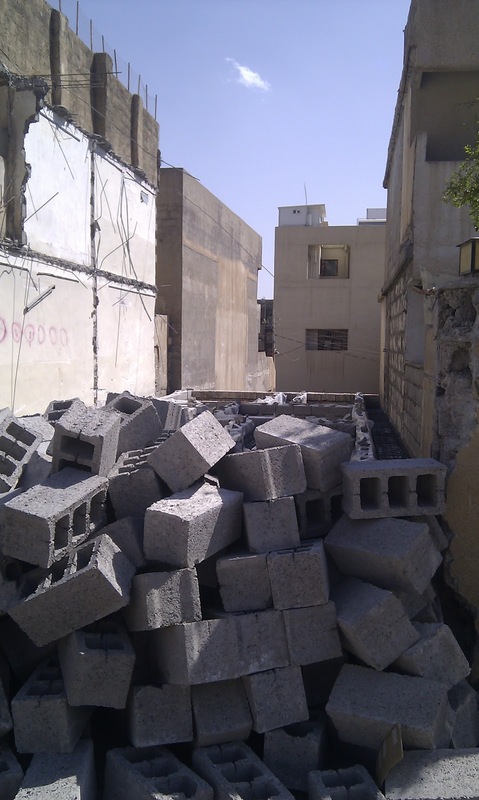 Protests against demolition are not heard of in Kurdistan, and it is hard to get people to realize they should treasure their national heritage. I wrote before in this blog about Al Qosh, and the Jewish heritage getting lost there. I've been there since, taking people to see it, and I talked about it to (international) officials whom I hope can help. Recently the key-keeper of the ruins of the synagogue has died. And the bones of the prophet Nahum the Jews came to worship here up till the fifties when most of them left, have been transferred from the tomb in the ruins to a Assyrian Church nearby - as the Christians consider Nahum as a Saint. 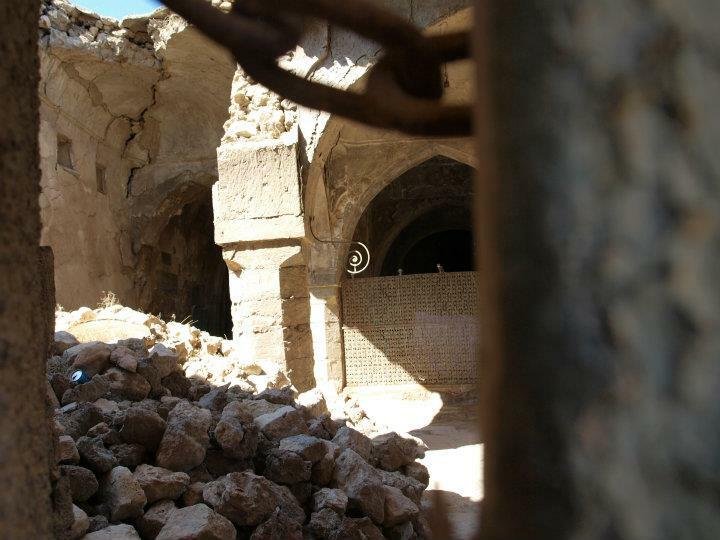 The synagogue in Al Qosh still badly needs repairs. It does not have to be rebuilt, but something has to be done to keep what is left at least. Because it is part of Iraq's heritage. The plight of the Jews, who were very much part of the fabric of the society but left almost all within less than ten years, needs to be remembered and retold. The synagogue will be a landmark in this remembrance. My present home town Sulaymaniya has lost most of its old Jewish quarters, although the area still is called the Julekan. And there are a few buildings in the town center that still tell you the story of the old town, where the only king the Kurds have had in the last century was from (the ringroad Malik Mahmoud is named after him). 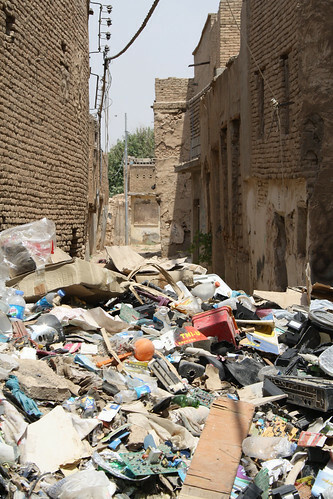 In Sulaymaniya's bazaar area there are still some houses from this era, but they are not well maintained and have been divided between a number of families living there. 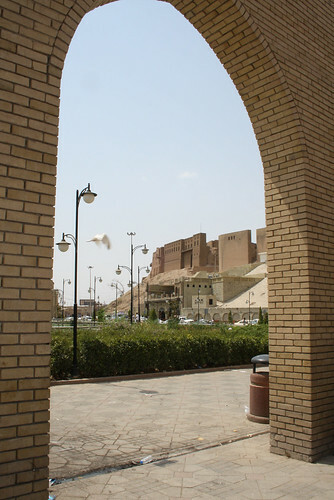 Even worse is the faith of the heritage of Erbil. The oldest inhabited area in the Middle East, with a citadel that is being preserved with the help of Unesco, it is quickly loosing the rest of its antique buildings. When part of the centuries-old bazaar was pulled down, nobody protested. And the result is of course special; it gave the city the heart it needed, with the citadel as its center. Yet, all this was done without any real discussion about the value of what was being demolished. 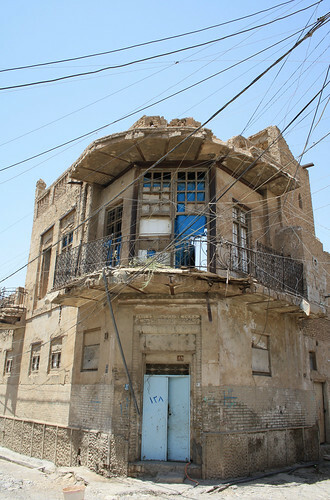 And Erbil has an even bigger problem than Sulaymaniya with the preservation of its heritage. Around the citadel, old houses are crumbling. You can see from the way they are built - red brick stone and nice designs - that they must be at least fifty years and perhaps even a century old. Yet they are falling down, are being used for storage, turned into rubbish dump and are pulled down to make space for car parks. And as some of these derelict places are used by addicts to take their shots, I can predict the future: this area will also end up under the bulldozer. Already now, the local government has been putting up new, but seemingly old walls all around the city center to hide the old and derelict places. And by hiding them, they have ceased to exist. The last pictures I am showing here were made by my colleague Ako Kaleri, and can be found on this special place. He worries about this national heritage like I do. Because we both know, that countries need their history and they need their heritage. Only if you know where you come from, what your roots are, you can be a full person, and a complete nation. For this reason I join Ako in the request to our Kurdish politicians and decision makers. Respect your national heritage. Keep it, cherish it. Not only is there no future without a past, it will also bring you income. From tourism, and eventually also from housing prizes. Bring the old houses back to life, with new and modern insides in the old, repaired walls, and people will want to buy them. I have seen this happen in Amsterdam, in Edam, in Beirut, in Batroon, in Damascus even. Old eventually becomes attractive again. My dear Kurdish politician friends: please look after your past. You only get one. You need it to educate your youth to cherish what is valuable, instead of always wanting something new. Because the day will come, that new generations will be asking the question of who was responsible for pulling down their heritage. Don't let it get that far, please. this is true Judit in Iraq as well as in Kurdistan and almost in all oil-rich Arab countries. the old objects are considered something of the past that should be 'eliminated'. But when all the precious things of the past will be totally eliminated then these countries will wake up and realize who much ridiculous and senseless are 'modern' houses. Like in Europe until 50 years ago people were astonished by modernism trend, then fortunately they realized they were wrong, and started to rehabilitate the architectural heritage. So it needs time for them to understand, but when they start to understand the value of the old houses, then it will be too late.